Another bobbin lace bookmark using Christine Springett’s snake design, made for a friend. The colours are brighter than the photo shows. I send these bookmarks in sleeves even though I usually use my own ones without them. The snakes do tend to twist if they are used without a sleeve, which is a bit of a nuisance, so I leave it for the recipients to chooose. 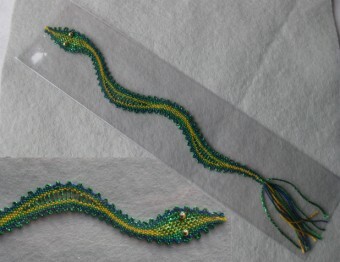 They are fun to do, and seem to be popular.Â I might make some ‘lacier’ bookmarks to have ready for future swaps. What I really should be doingÂ is making some thingsÂ for our guild challenge and exhibition.Â Â Entries are supposed to be in by AprilÂ 21st, which doesn’t leave much time.Â Â IÂ have some ideas, but I’m still procrastinating.Â I do have some finished items for the exhibition,Â but I’d also like to make some things for the ‘small sales table’ there. My Secret Santa from the Fiberlings chat group sent me a beginners book on the ancient craft of nalbinding, so I’ve been experimenting this evening. This is my first attempt. There are a few mistakes (or possibly more than a few) and the tension is erratic, but it’s a start. The book is Nalbinding Made Easy. Thanks, Eboni, and thanks also to Kiara, who helped advise on the choice of book. The warp and weft were 12/2 white mercerised cotton. 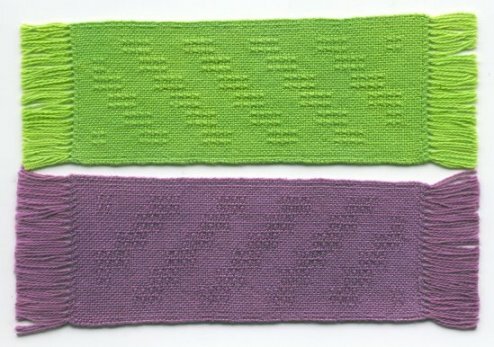 I used fibre reactive dyes to dye the finished bookmarks. 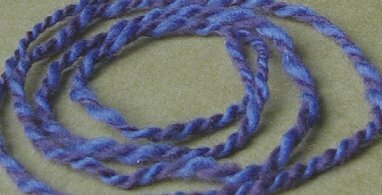 The dyeing wasn’t completely successful as too much of the dye washed out, changing the colours, so after those, I wove a few for Christmas presents using lilac 12/2 weft. I went back to bobbin lace after a long break to make the rest of my exchange bookmarks, and I have really enjoyed that. I have done 3 so far, with one more to do, but I’ll make a couple more for presents. Here is a picture of the (almost-)dry bowl, with the colours looking closer to the real colours, and one of the yarn I used. 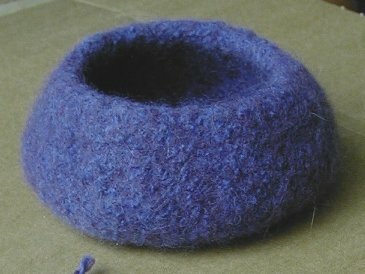 Since I last posted, I’ve been working on a knitted-then-felted bowl for an exchange on one of my lists. 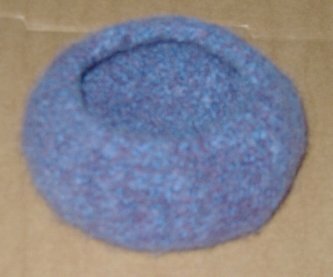 I’ve never intentionally felted knitting before. 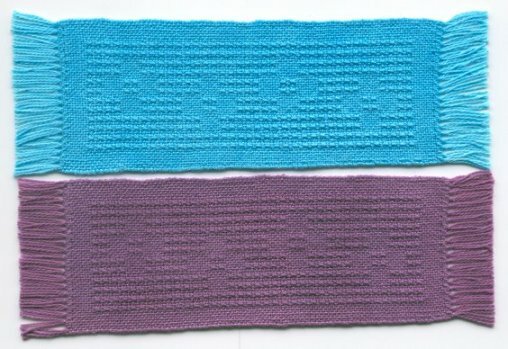 I made small swatches using various commercial merino yarns, and even knitting with merino roving, but I didn’t like the way they turned out. In desperation, I tried some thick 2-ply handspun merino from a few years ago. I only had 65 yards of it, but I thought that might be enough for a swatch and a bowl. That swatch looked a lot better so I went ahead with the bowl. 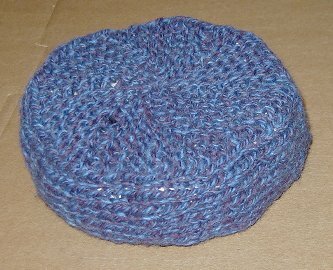 I knitted it like a round garter stitch dishcloth with short row wedges (here is an example of what I mean), but on the outside, I did a similar number of stitches of stockinette with no shortrowing, so that section gets forced up to become the side of the bowl and another 3 stitches for an I-cord edging to make the rim. 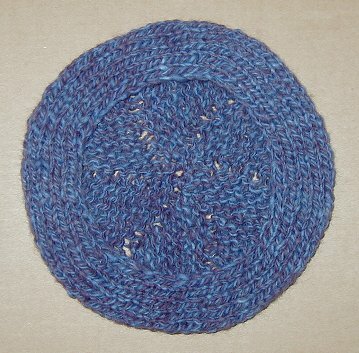 The I-cord pulls in the rim, which I hoped would make a nice shape, and I think it has worked. It needed a second run to get it firm enough. By the time it came out the second time, it had shrunk from the original 6″ across the base section by 3″ high to 4.5″ by 2″. It’s not dry yet, so I’ll try to remember to post the final pictures tomorrow, along with the yarn I’ve dyed for the EG scarf/wrap. I’m working on it, really!